Working out with a weighted hula hoop can help tone the muscles in the arms, legs, back and abdominals. Because you have to keep your muscles tight in order to revolve the hoop around your hips, weighted hula hoops work your muscles harder than light-weight hula hoops. Besides improving strength, weighted hula hoop exercises can help increase pelvic flexibility and improve balance, according to "Fitness" magazine. Warm up with a light 5-minute cardiovascular activity such as jogging in place or bicycling. Step into the center of the hula hoop, grasp both sides of the hoop with your hands and lift the hoop up so that it is pressing against your back. Position one foot slightly in front of the other and bend your knees. Spin the hoop quickly around your waist, rotating it around your bellybutton. Rock your hips back and forth, catching the hoop with your waist and pushing it around your body in a circular motion. Increase the speed for one minute, rotating the hula hoop around your hips as fast as you can. Perform squats as you hula hoop by bending your knees and lowering your buttocks down as if you are sitting in a chair. Aim for 12 repetitions. Step out of the hoop and hold it in front of your body with your right hand. Bring the hoop around your body in a circular motion, passing it to your left hand when it reaches your back. Continue swinging the hoop around you for one minute, passing it from hand to hand. Repeat the entire sequence for a total of 30 minutes. Cool down for five minutes with a light cardiovascular exercise such as walking. Rotate the hoop in the opposite direction if you find it difficult to keep the hula hoop going. Right-handed people sometimes find it easier to rotate the hoop from right to left and left-handed people from left to right. Try rotating it both ways to see which is easiest for you. 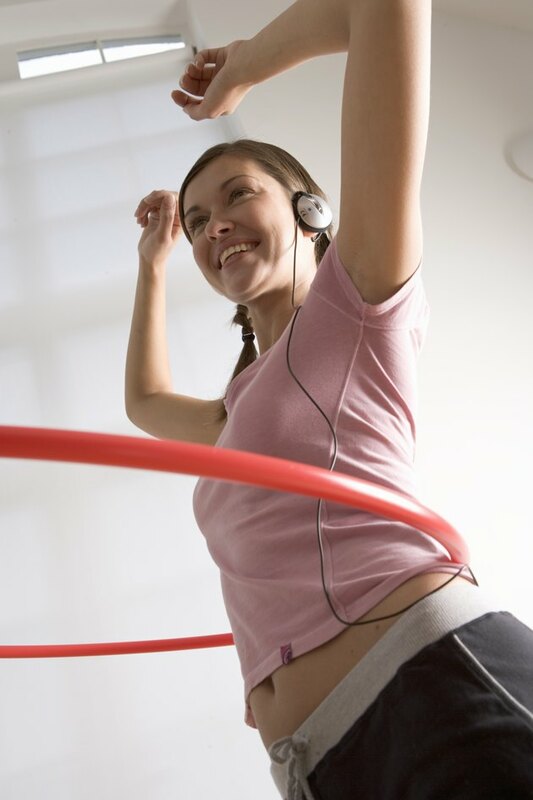 To prevent injury, start out with a light hula hoop -- 1 or 2 pounds. Gradually work your way up to 5 pounds or more as your strength improves. What Muscles Does Hula-Hooping Work?